Click the title or thumbnail image of your chosen data layer to be taken to its About page. This will provide you with a range of information about your chosen data. Scroll down the About page to License. Under this heading, you will be able to view the license for your chosen data layer. 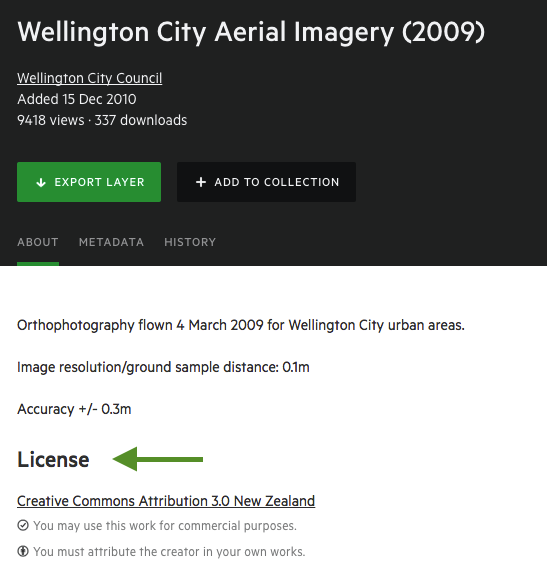 For Creative Commons licensed data, we provide a short, ‘human-readable’ summary of the licence terms, as well as providing a link to the full legal text. Click the link provided to view the full legal text of the license. In some cases, additional usage information will be entered into the layer description as well. Take care to read both the layer description and the attached license. Note that licences are provided by data publishers, which means that Koordinates is not a party to the license. The license agreement, that is to say, is between the publisher and the user.